Illinois' Nathan Scheelhaase (2) throws the game-losing interception during the game at Beaver Stadium in State College, Pa. on Saturday, Nov. 2, 2013. The Illini lost in overtime, 24-17. Illinois trailed Indiana by seven and had been trading punches with the Hoosiers all day long when head coach Tim Beckman called a fake punt with 11 minutes to play. DuVernois threw the ball, for all intents and purposes, directly into the ground. The Hoosiers scored two plays later and never looked back. 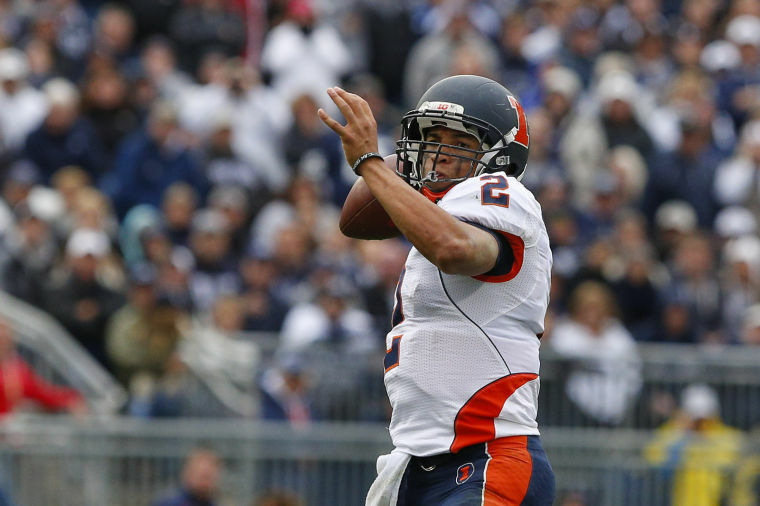 The Illini watched their bowl hopes go from meager to microscopic. The Illini had rallied from a 28-point deficit to pull within 12 of the Buckeyes. When Nathan Scheelhaase’s helmet came off, forcing him to sit out a play, backup quarterback Reilly O’Toole came in and fumbled in the end zone for a safety — his only appearance of the game. Beckman and offensive coordinator Bill Cubit followed it up with a verbal argument on the sideline. Illinois was down 7-3 with seconds remaining before halftime. Spartans quarterback Connor Cook threw the ball up for grabs and two Illini, Jaylen Dunlap and Eaton Spence, both had a chance to intercept the ball. It bounced off both their hands and landed in the lap of Spartans receiver Bennie Fowler, who was waiting in the end zone, for a touchdown. Illinois had battled so hard to try to end its long conference losing streak with a win over the Nittany Lions. When Penn State scored first in overtime, Scheelhaase promptly threw an interception on Illinois’ first play of the extra period, losing the game. The play was a reverse gone horribly wrong. Not only was Lankford lost for the season after being hit by a Michigan State defensive lineman, which ended his Illini career, but the Spartans also recovered the fumble and went on to score its first points in a 42-3 blowout of the Illini. Only 37,058 fans came out to watch two of the worst teams in the Big Ten in the season finale. The half-empty Memorial Stadium watched the Illini lose for the eighth time in 2013. Block I gave its best shot at halftime card stunts, despite having only about 150 members present. Sean can be reached at [email protected] and @sean_hammond.